One advantage of our Buenos Aires apartment is that, in Palermo, it has access to some of the city’s biggest open spaces. 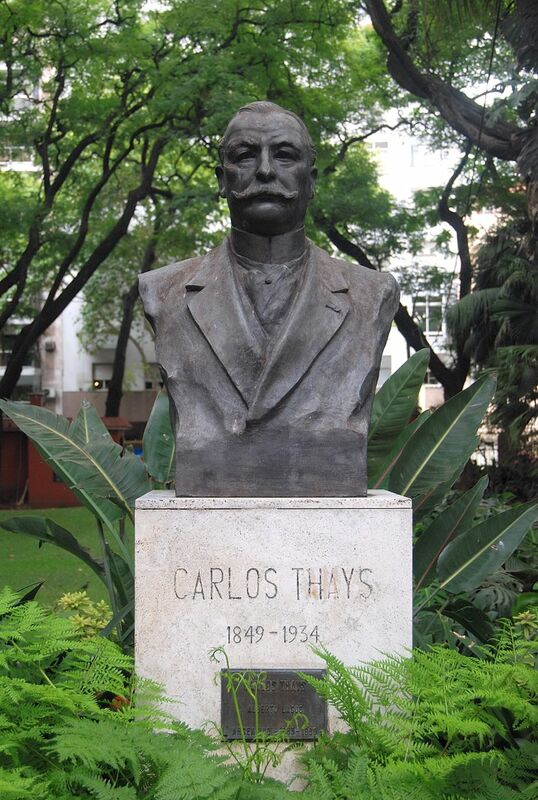 We are just minutes from the sprawling Parque 3 de Febrero, and even closer to the Jardín Zoológico (city zoo) and the Jardín Botánico, the classic botanical gardens designed by French landscape architect Charles Thays (pictured above). 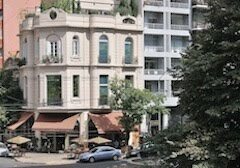 In a neighborhood where our nine-story building is one of the smaller structures, the availability of green areas contrasts dramatically with densely built areas like the traditional Microcentro, where constructions of lesser or greater antiquity cover virtually ever square foot. Nevertheless, those open spaces have some shortcomings. Maintenance of the lawns and trees is less than perfect (though better than in many other parts of town). The worst drawback, though, is the infestation of feral felines in the Jardín Botánico where, said a source that I can’t locate at present, more than 200 ownerless cats survive on seven hectares. It’s not the only place where Porteños abandon kittens that, as fast-growing adults, kill birds that frequent the grounds, but it’s the most conspicuous one. The problems go beyond that, however, as uncontrolled cats are also a public health hazard. 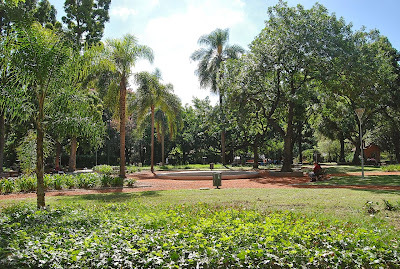 Adjacent to the Botánico, Plaza Intendente Casares (pictured above) is another public park where the clawed creatures sneak through the fences to roam at night and, until recently, they used the sandy playground, where children frolicked in the daytime, as a litter box. Fortunately, since a recent remodel, a cat-proof fence now surrounds that playground. In our neighborhood, street dogs are no problem, though thoughtless dog owners often leave the sidewalk splattered with canine soretes. 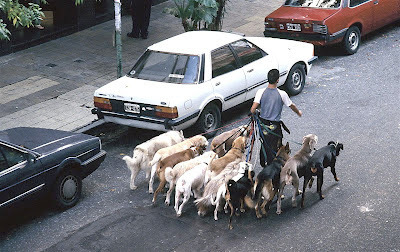 The city’s paseaperros (dog walkers) are often more responsible in this regard than the apartment dwellers whose dogs they exercise. As a dog owner and lover myself, I usually carry a plastic bag or two with me and, when I see someone’s purebred defecating on the sidewalk, I smilingly hand them one with a polite “Se te cayó algo” (“You dropped something”). Usually they get the point. 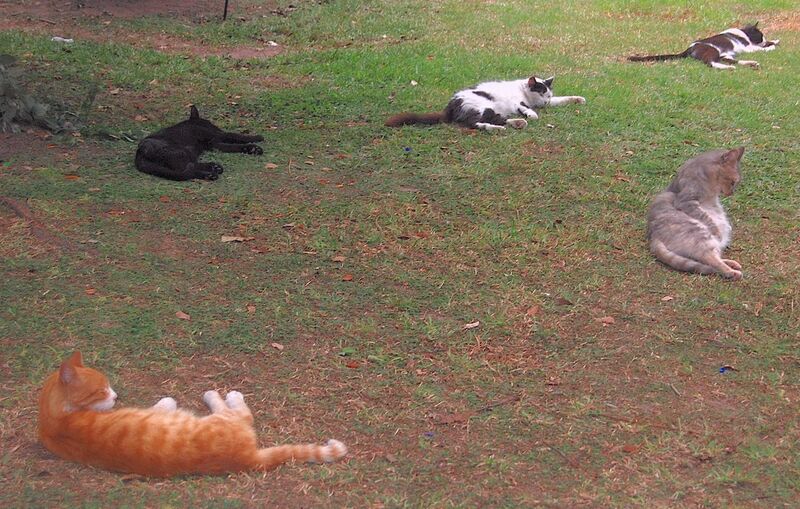 In other parts of the city, street dogs can be an issue, but in Palermo it’s almost exclusively cats. I have my doubts that either adoption or the “solution” of neutering them and returning them to their point of capture, so often suggested in the United States, will be anywhere near sufficient to solve the problem. As announced recently, there’s been a postponement of my digital slide lecture on Buenos Aires at Tango by the River in Sacramento, which will now take place Friday, October 26th, at 6 p.m.
Today’s entry analyzes recent happenings around the Río de la Plata. By consensus, state-run Aerolíneas Argentinas is a disaster for its shoddy service, inability to keep its schedules, and propensity to hemorrhage money. After its renationalization in 2008, it came under the dubious control of the Peronist youth wing La Cámpora and, by all accounts, things have just gotten worse, with losses averaging upwards of US$1 million daily. 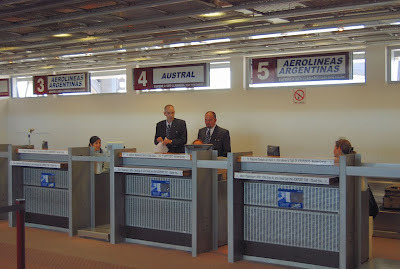 When counseling potential visitors about travel to Argentina, I tell them to avoid Aerolíneas whenever possible, in favor of LAN Argentina, the local affiliate of Chile’s LAN Airlines. Unfortunately, LAN has fewer planes and flights and, despite the company’s desire to expand its services, it will not be able to do so. That’s because, according to the Buenos Aires daily La Nación, the Administración Nacional de Aviación Civil (Civil Aviation Administration) has rejected LAN’s request to add a new Airbus 320 that would have allowed the airline to expand its Patagonian routes. Given the current government’s extreme protectionism, its rejection of LAN isn’t exactly startling, but it comes at great cost. 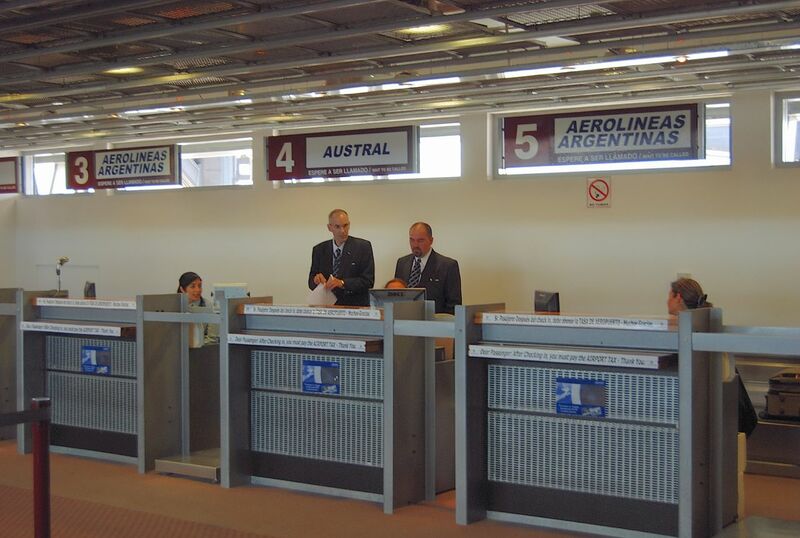 The country loses a US$40 million investment that would have improved and expanded air services for Argentines and visitors alike, and created a number of permanent jobs. Anonymous sources quoted by La Nación suggest that the government was worried that LAN would take business away from Aerolíneas. In a sense, such worries are legitimate. LAN is an exemplary airline, even as it endures the difficulties of operating under an often capricious Argentine political and economic system. Aerolíneas, on the other hand, embodies that very capriciousness and, on a level playing field, is probably incapable of competing with LAN. 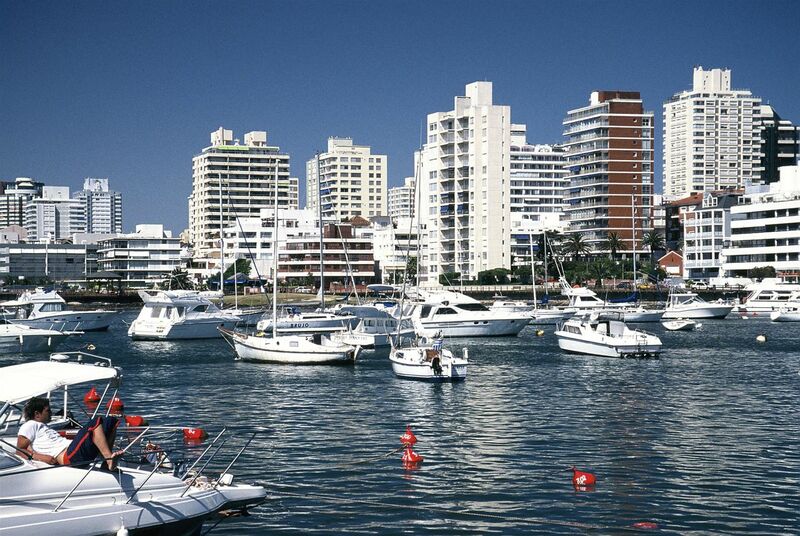 Uruguay’s tourism sector is concerned about this coming summer because of the so-called “currency clamp” instituted by the Argentine government, about which I have written several times recently. Uruguayan President José Mujica, though, doesn’t appear to share that concern, even though his country’s prosperity depends, in part, on the annual Argentine invasion of Punta del Este (pictured below). That’s because, said Mujica as quoted in Saturday’s Buenos Aires Herald, “Argentines are champions when it comes to taking dollars abroad! World champions!” despite the restrictions. “Argentines distrust their currency, save in dollars and somehow manage to make it.” Whether the Argentine government shares Mujica’s admiration for its cleverly evasive citizens is doubtful. As announced the other day, there’s been a postponement of my digital slide lecture on Buenos Aires at Tango by the River in Sacramento, which will now take place Friday, October 26th, at 6 p.m.
Once, in a conversation with Buenos Aires Herald restaurant critic Dereck Foster, I told him that I sometimes liked to get takeaway sushi for dinner. Dereck, an Anglo-Argentine who’s been doing this for more than half a century, needled me with the admonition that sushi should always been fresh, so I had to explain myself in greater detail. To get my sushi, I went to a wonderful restaurant called Libélula, barely a block from home. Libélula, which later moved and has since closed, was in fact a pioneer Peruvian restaurant, but it had an extensive sushi menu that owed its origins to a small but influential wave of Japanese immigration to Perú that began in 1899 (though most Peruvians might like to forget the corrupt and dictatorial presidency of Alberto Fujimori. It’s worth adding that Argentina has its own history of Japanese immigration, most visible in and around the Buenos Aires suburb of Belén de Escobar, known as the Capital Nacional de la Flor (National Flower Capital), partly because of its Japanese horticultural tradition. In any event, at Libélula, I would take a seat at the bar and nurse a pisco sour while the sushi chef – of clear Japanese descent – prepared my dinner. Then, when all was ready, I would pay the bill, tip the bartender, and walk home to enjoy a solitary sushifest before sitting down at the computer to update the day’s information to the new edition of MoonHandbooks Buenos Aires. In doing so, I saved both money and time. Libélula is sadly gone, but Peruvian cuisine – perhaps the most diverse and flavorful on the entire South American continent - is flourishing in the city. It ranges from plain and inexpensive eateries such as Monserrat’s Status, which gets a genuinely Peruvian crowd, to midrange to upscale Palermo restaurants such as Bardot and some elite options. The truly elite option is Astrid y Gastón, which opened in our neighborhood shortly after Libélula closed. In reality, Astrid & Gastón is now a small empire of restaurants that started in Lima with now celebrity chef Gastón Acurio and his wife Astrid. It’s since expanded to several other Latin American capitals, including Santiago and Mexico City, and even Madrid, without losing its flavors and elegance. 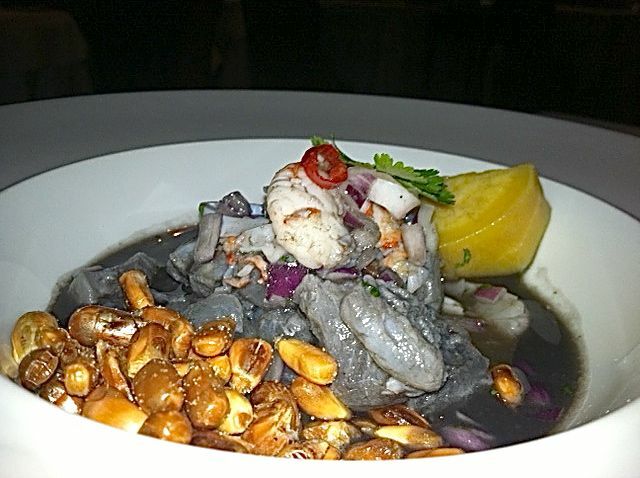 I’ve been to the Buenos Aires locale only once, for a brief lunch, but my wife María Laura went for dinner with a friend last week to enjoy dishes such as cebiche con leche de pantera (ceviche with squid ink, pictured above), a flavorful mix that includes fresh fish, shrimp, scallops, sweet potato and red onions. That was a starter, but the main dishes included arroz con pato (braised duck and rice, pictured below) and pescado con salsa huacatay (catch of the day, with a sweet and sour sauce). For the two of them, with appetizers, pisco sours and wine, the hit came to around US$150, so this is not a budget choice. 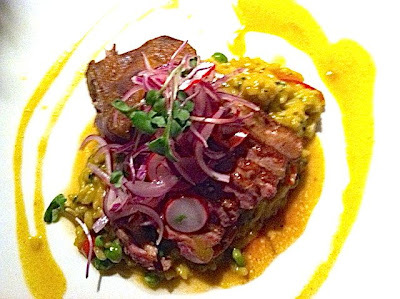 Sadly, Peruvian food has not made a major impact in the United States. A couple weeks ago we heard of a new place that opened in Berkeley but, on arrival, we learned that it specialized in barbecue chicken (which, though it’s popular in in Peru, was not the seafood or ají de gallina we’d been hoping for). On the other hand, Acurio has opened up a separate gourmet chain called La Mar Cebichería Peruana, which has branches in New York and San Francisco, so diners in those cities can now sample gourmet Peruvian food, focused on fish, ceviche and sushi. 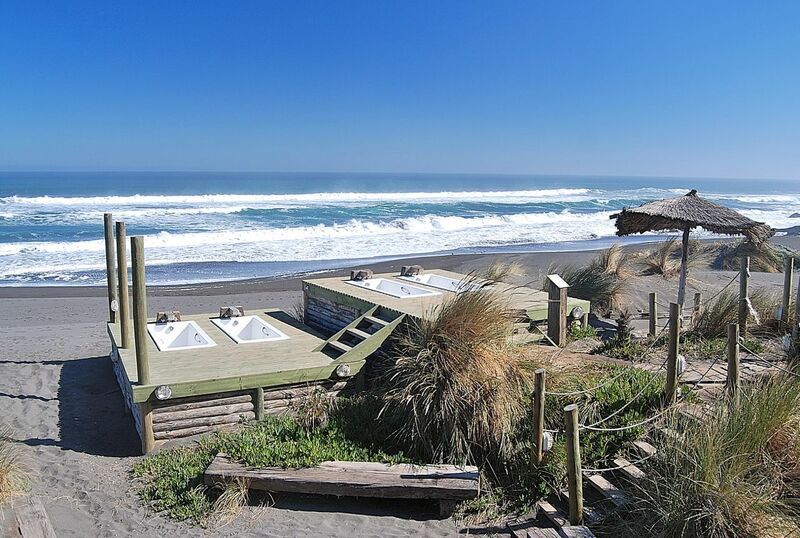 We’ve not gone there yet, but we do enjoy San Francisco’s Destino. Even in other South American countries, Peruvian food doesn’t make it much outside the capital cities. Oddly enough, I’ve never seen it in Uruguay, but it’s a bit more prevalent in Chile, which has seen substantial Peruvian immigration over the past decades. That’s a topic for another day, though. Once a year or so, The New York Times travel section condescends to publish a Latin American issue, devoting its 12 pages to a region that, south of Mexico and parts of the Caribbean, gets barely a mention the rest of the year. Last Sunday’s edition features a photo essay on Santiago’s newly fashionable Barrio Italia, an area that also includes the Museo Frei and Puerto Perú, one of my favorite restaurants in the city (I’m planning a future post about Peruvian food). 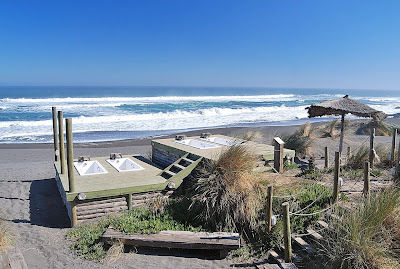 It also includes a longer article on Pichilemu, the Chilean surfing capital that's just a short drive from the Colchagua wine district. That’s good as far as it goes, but author Ondine Cohane stumbles when she inexplicably refers to Chilean horsemen as “gauchos” when she attends a local rodeo. “Gaucho” is properly River Plate Spanish (Argentina, Uruguay, Paraguay and Brazil, where it’s gaúcho). 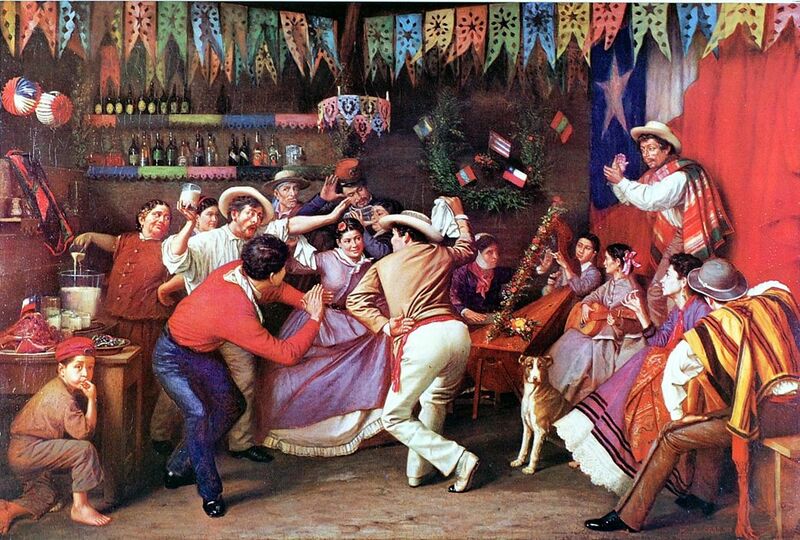 It’s also used in southernmost Chilean Patagonia but, in the Chilean heartland, her “gauchos wearing different striped tunics” are in fact huasos dressed in ponchos, and she fails to identify the traditional dance she views as the cueca, the staple of Chilean folklore (as depicted in the 19th-century painting below). It’s not surprising that Cohane, an editor with the Euro-centric Condé Nast Traveler, might oversimplify regional details, but the Times’s own fact-checkers clearly failed here. 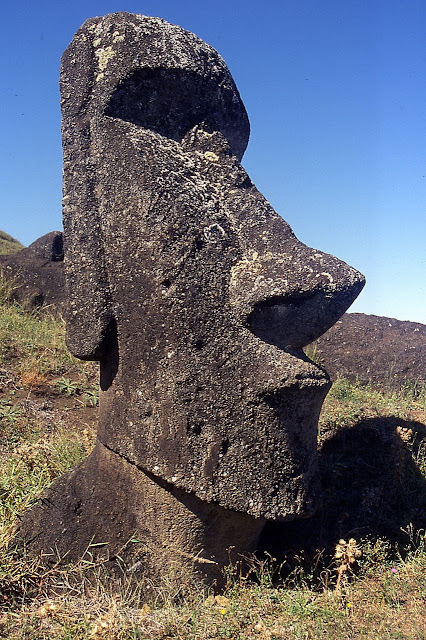 Recently, I wrote a post about Chilean icons in the current US presidential elections that included a New Yorker cartoon caption contest that caricatured the current opposition nominee as the face of the stationary moai of Easter Island (known as Rapa Nui to its Polynesian residents). The link in the previous sentence will take you to three wryly clever reader-submitted captions, with a choice to vote for one. I’ve made my choice and, when the winner is announced next week, we’ll see if other readers agree with me. 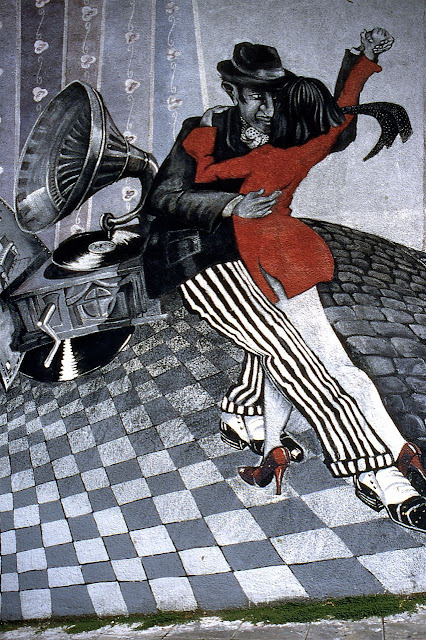 As announced earlier, I will give a digital slide lecture on Buenos Aires at Tango by the River in Sacramento, but illness (not mine) has postponed the event. It will now take place Friday, October 26th.